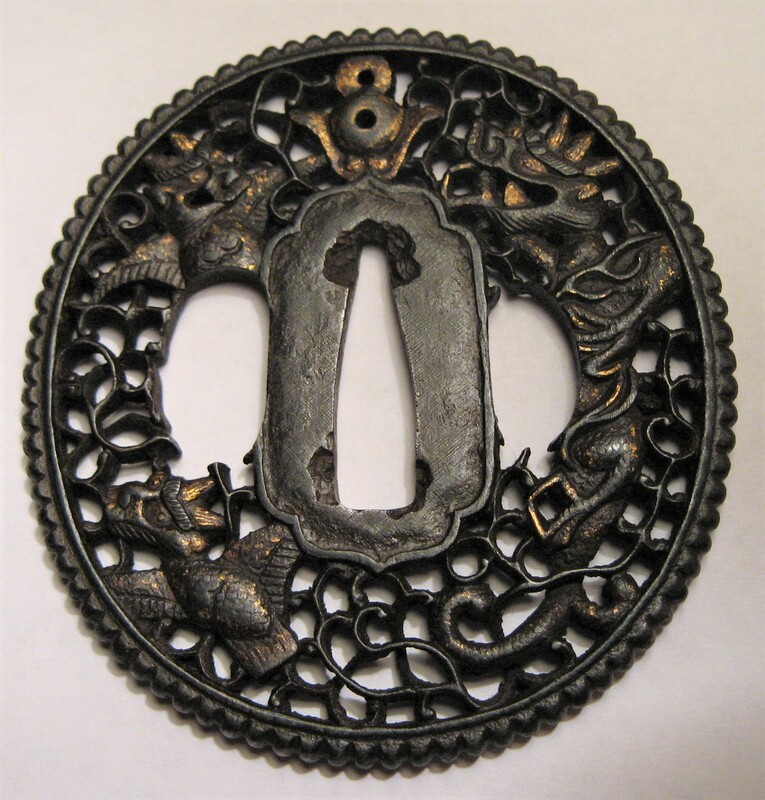 It has been determined that a great many sword guards were produced outside of Japan and imported by Portuguese, Dutch and Chinese merchant mariners, making it improper to label them Japanese. They were produced in places such as Thailand, Vietnam and China, where Japanese swords were highly prized, and often imitated. With correct study, one can easily notice the difference from Japanese copies. Therefore, let those known to be exports be identified as Asian Sword Guards. The ASIAN SWORD GUARD group are those produced in China, India, and Monsoon Asia, and imported from the end of the 16th century for Portuguese, Dutch and Chinese merchants; primarily for use as art objects, business and diplomatic gifts. Mandarin: pronounced hushou or pan hushou. Pan = plate. Hu = to guard. Shou = hand. Kiyou Tojin: Sword guards made by Chinese artists in Nagasaki. In all other instances it makes perfect sense that foreign-made sword-guards formerly known as 'Nanban tsuba' be reclassified as 'Asian Export sword guards'. 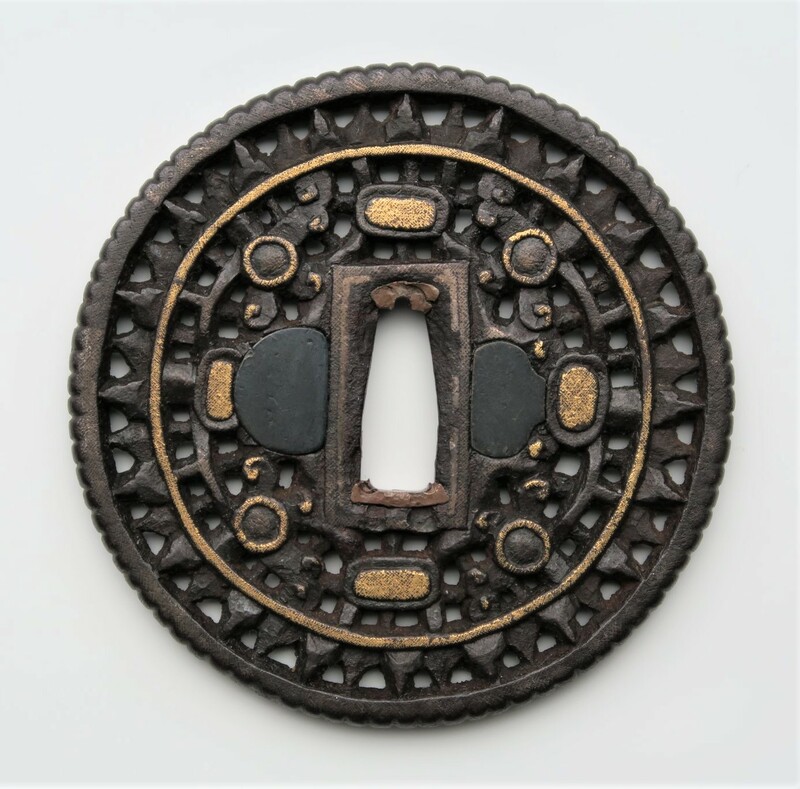 Because 'Nanban tsuba' is a term that would only have been known to Japanese makers, let it apply exclusively to their work. 'Kanton' is a corruption of Gunagzhou, China's largest seaport. In the first ten years after the opening of Chinese maritime trade by the Kangxi emperor in 1684, hundreds of Chinese 'Tosen' merchant ships arrived at Nagasaki. The Chinese inhabiting Nagasaki's 'Tojin Yashiki' (Chinatown) grew to almost 10% of the city's population, versus a dozen Dutchmen living on Deshima. 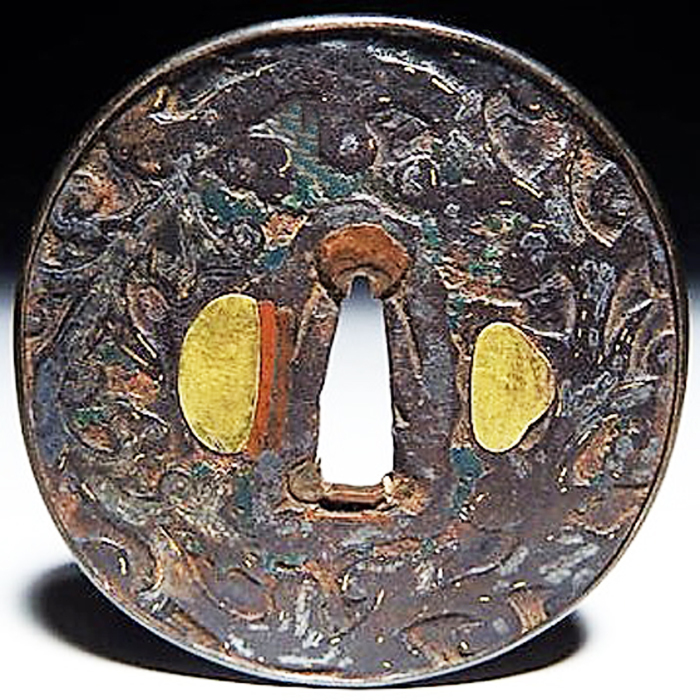 The term 'Kanton' may refer to the Qing merchants who first imported sword guards to Japan. 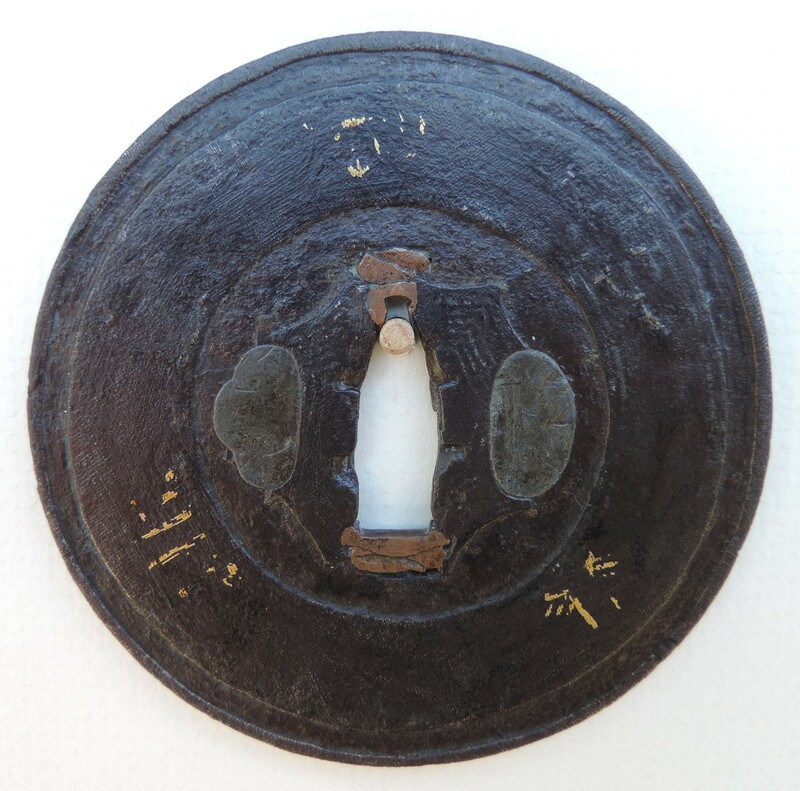 The Dutch were known to have used tsuba as gifts in their dealings with the Japanese. They are also known to have purchased gifts from the Chinese in Nagasaki in years when no ships arrived from Batavia (Jakarta). Large rectangular sword guard. Iron with gold wire inlay. 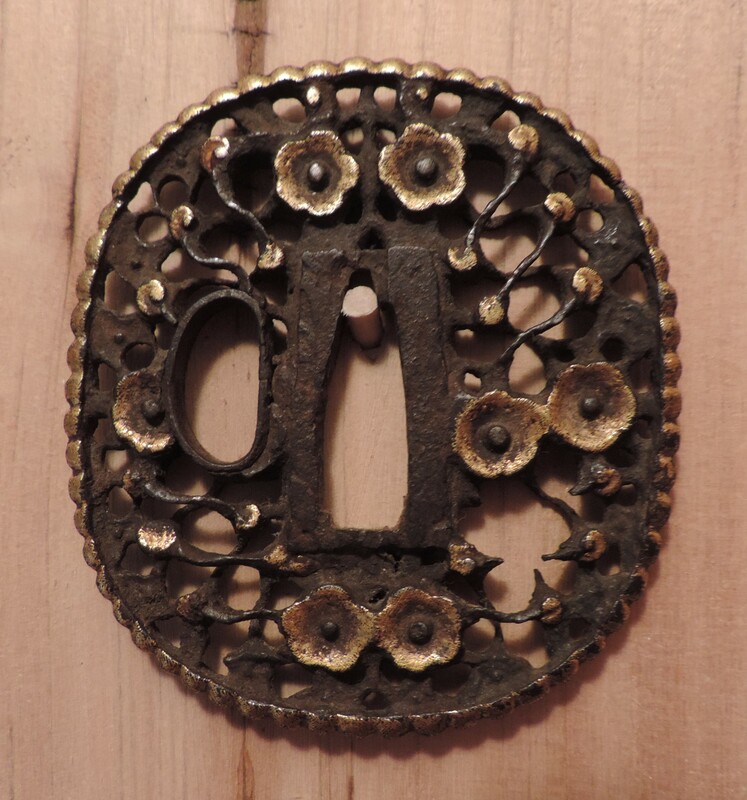 The manner of execution represents a high degree of artistic ability, suggesting that this piece was made along maritime trade-routes, where artisans had access to decorative arts from around the globe. 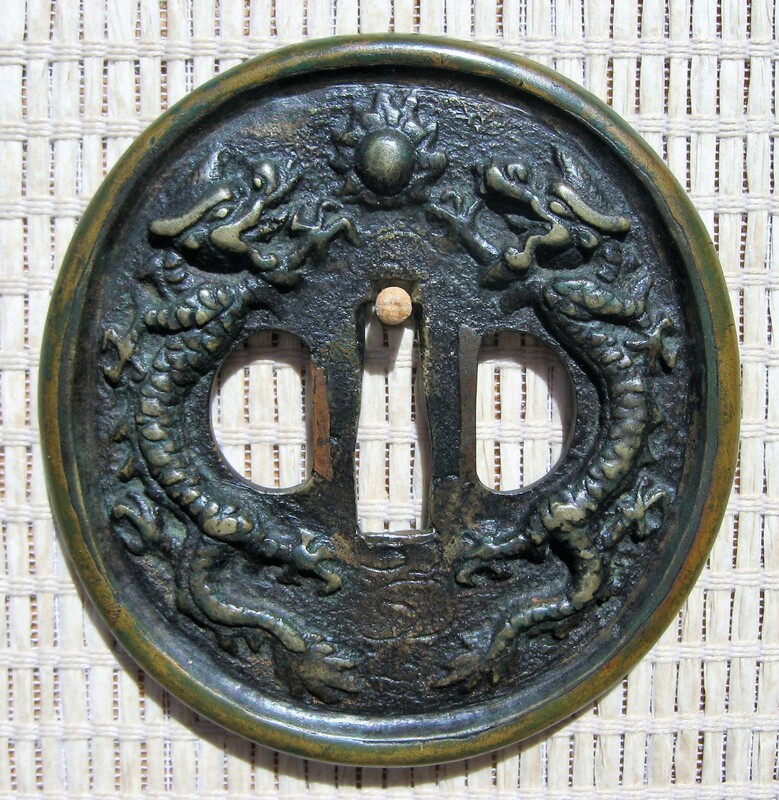 The indented corners, pointed Shitogi-gata seppa-dai, smooth-skinned with inlayed scales dragons and almost caricature drawing - style points to Indochina, perhaps Tonkin. Another very fine guard made by a Chinese person who came to Nagasaki. "A well-hammered iron plate with a dark chocolate patina and decorated with a pair of phoenixes. The very thin plate and rich patina suggest considerable age. 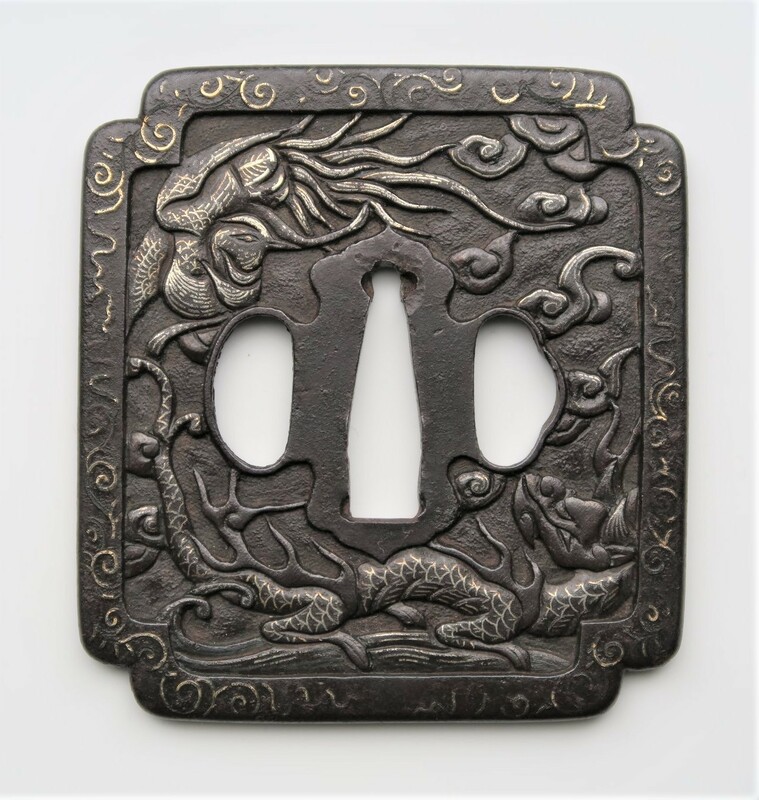 Made in China during the Ming period, ca 1600 or earlier. Upon arriving in Hizen, adapted to Japanese use. On the omote face are very artistic representations of two fenghuang (phoenix). One of the twelve signs of the Chinese zodiac, the phoenix is a Chinese symbol of honesty, as well as physical and moral fortitude. From the Jiaqing era (1522–66) of the Qing dynasty onwards, a pair of phoenixes was differentiated by the tail feathers of the two birds, typically together forming a closed circle pattern—the male identified by an ood number of long serrated tail feathers (odd number being a masculine, or yang number) and the female by what appears to be an even number curling or tendrilled tail feathers (even number being feminine, or yin number). From a Japanese family in Hizen, an heirloom. Momoyama to early Edo period. 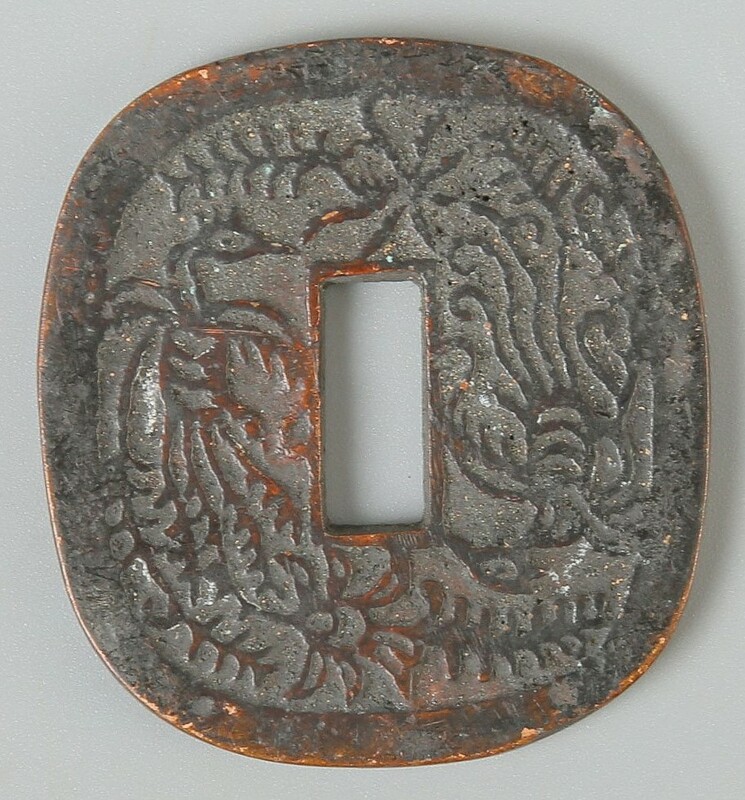 Appears to be Chinese, modified to Japanese use as evidenced by the hitsu-ana. The nakago-ana has been modified as the original shape was rectanglar which would conform to the cross-section of a Chinese pei-dao tang. The kozuka-histu appears to have been added later, because it is delineated by a metal band inserted into the aperture cut through the design. This most likely being performed by someone trained by the Yagami school. That technique seems to be one of their specialities. It seems that Nagasaki was the port of entry for most of these imports, and Hizen the center of "Nanban" fittings production. It seems that the market was driven by the Dutch need for diplomatic and greeting gifts, and the demand of gifts and souvenirs (miyage) by graduates of Rangaku and Chinese medical training (in Nagasaki). 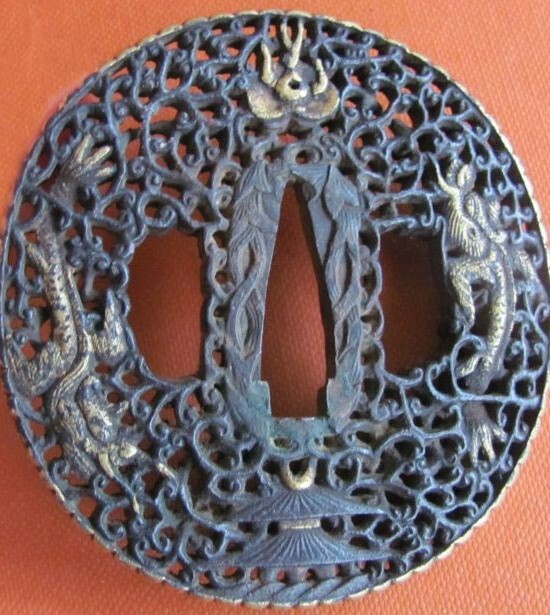 "Round iron plate with very fine silver nunome zogan of two Nagas - a mythological Indochinese creature. In Indochina (Thailand, Laos, Cambodia and Vietnam) they have leonine heads with long forelocks. These represent the great Naga King of the Eastern Sea, master of storms and all things marine. 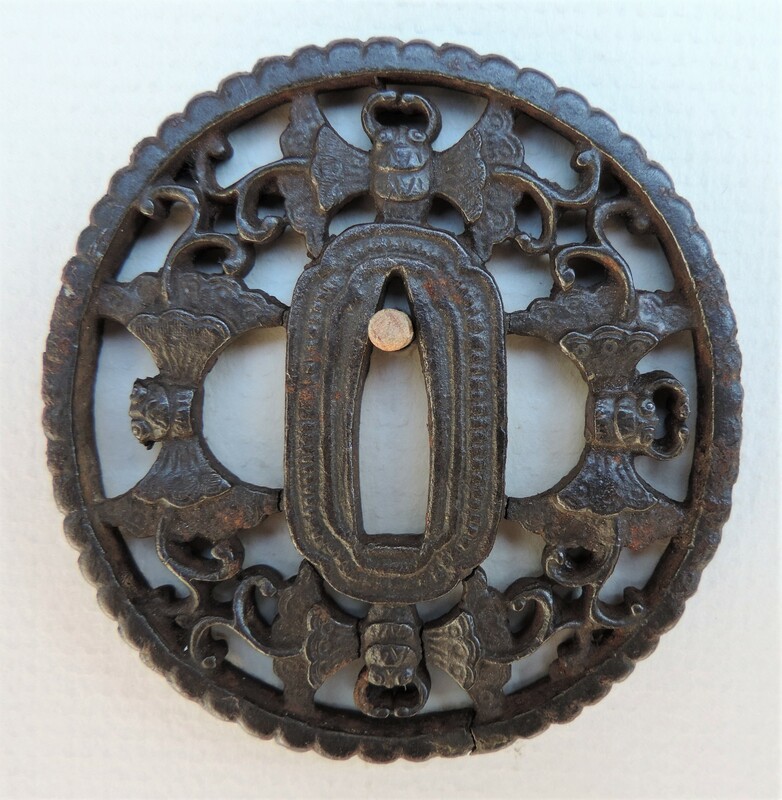 On the reverse are various Indochinese symbols all done in very fine silver inlay. 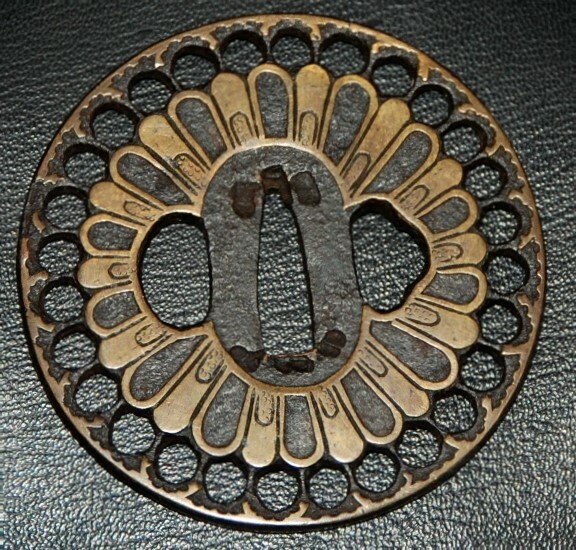 The entire motif is not Japanese, but based on the nakago-ana, hitsu-ana and pipe-like circular (chukushiki dote mimi) rim, this was produced in Hizen. 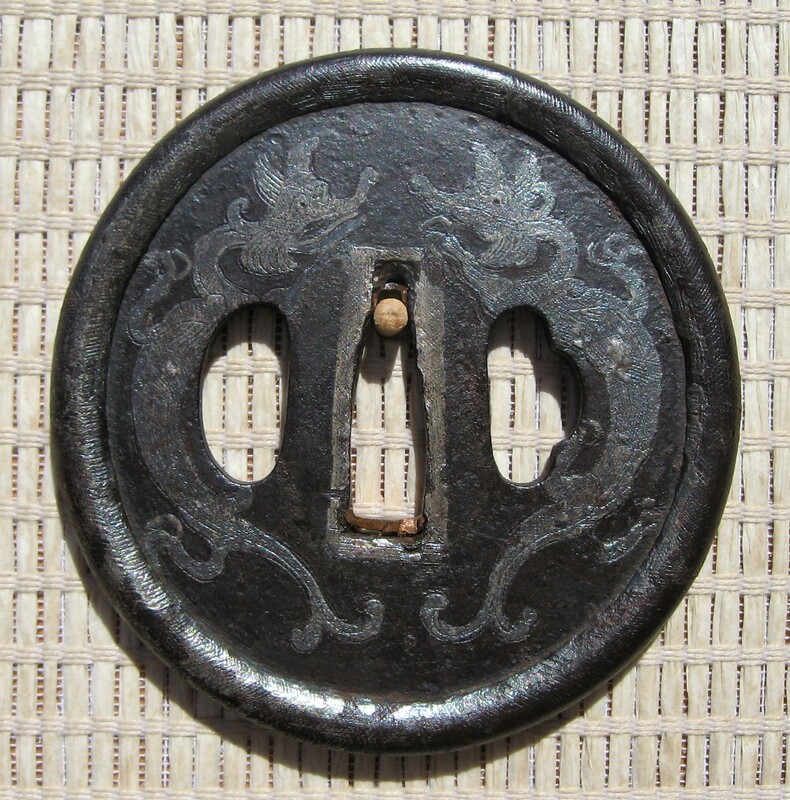 An iron guard made in China, exhibiting strong Sino-Tibetan influence. The rims of early Chinese guards are often doubled, as displayed here. They are divided by a series of radiate, pointed lotus-petals, carved in openwork or sometimes rounded. The exterior rim might be milled or beaded but in this case is plain. The direct, even rough character of the carving is part of its original aesthetic. It was not common for Chinese swords to be fitted with bye-knives. For this reason the presence of hitsu-ana would indicate a later modification. 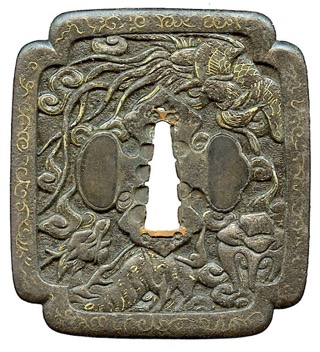 Iron guard carved in a Sino-Tibetan style. Two water dragons chasing a flaming jewel set in a tangle of interwoven tendrils representing waves. This design originates in ancient Mesopotamia. A stylized Qunshan (mountain peak) appears at the bottom of the design which paired with the wave design represents the protection of the people by the emperor. The highlights of gold inlay on the crosshatched areas is very well done. 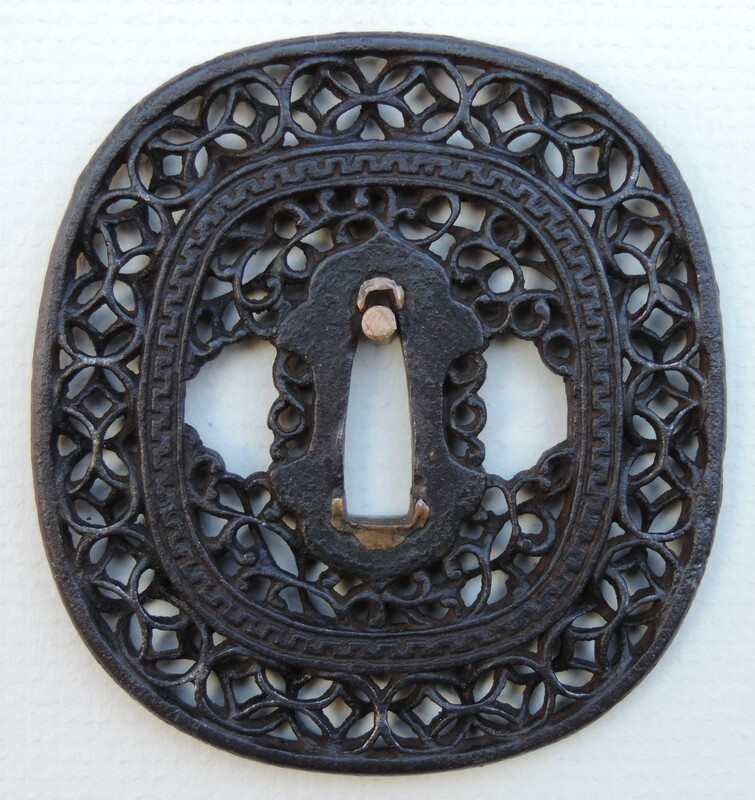 "A Qianlong style iron guard, finely carved in openwork, with traces of gold false damascening. The floral/foliate decoration is inspired by Tibetan and Central Asian saddle plates or Monsoon Asian textiles. This is clearly not Japanese. The mythological creature on the right side with its pointed forelock is reminiscent of the Mekong Phayanak. The other three creatures appear to have wings and tail feathers. The condition of this guard is excellent and shows that it was adapted to Japanese use. The highlights of gold inlay on the crosshatched areas is very well done. "Qing guard employing design tropes found on Qing imperial dragon-robes. The web is a tangled openwork of interlacing tendrils that represent moving water. The topic of the design is the carp becoming a dragon by leaping over the dragon gate on the Yellow River in China, signifying accomplishment. 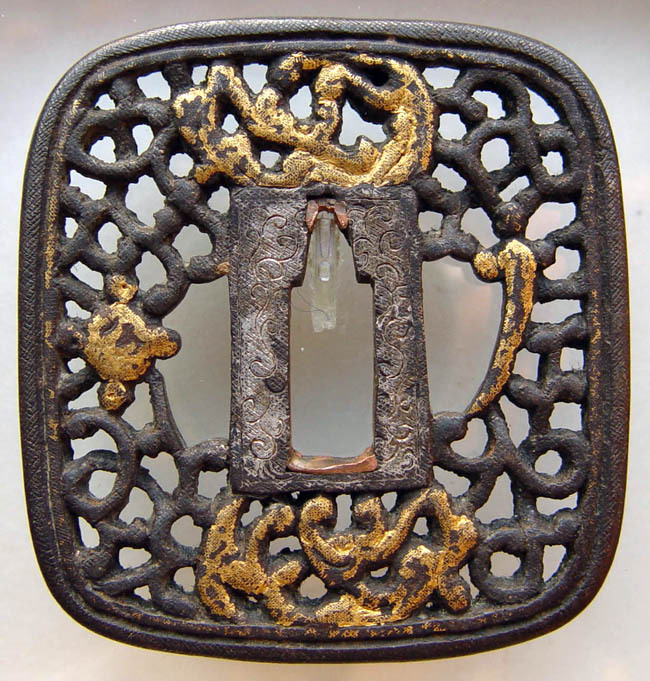 A Qianlong style iron guard, finely carved in openwork, with traces of gold false damascening. The floral/foliate decoration is inspired by Tibetan and Central Asian saddle plates or Monsoon Asian textiles. This is clearly not Japanese. The mythological creature in the lowest part with its pointed forelock is reminiscent of the Mekong Phayanak - river serpent. 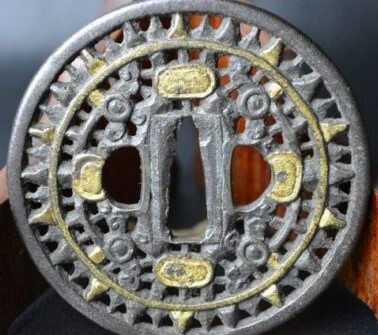 A Qianlong style iron guard, finely carved in openwork. The seppa-dai identifies the area of manufacturer. The inner rim has design of a key or fret pattern. The shape of the seppa-dai reminds one of an hour glass. Compare with the shape of Hosodachi guards, so-called shitogi-gata, from the Heian period. Obviously it copies a mainland (Sino-Korean) prototype that predated the development of the common discord guard we see today. The condition of this guard is excellent and shows that it was adapted to Japanese use. 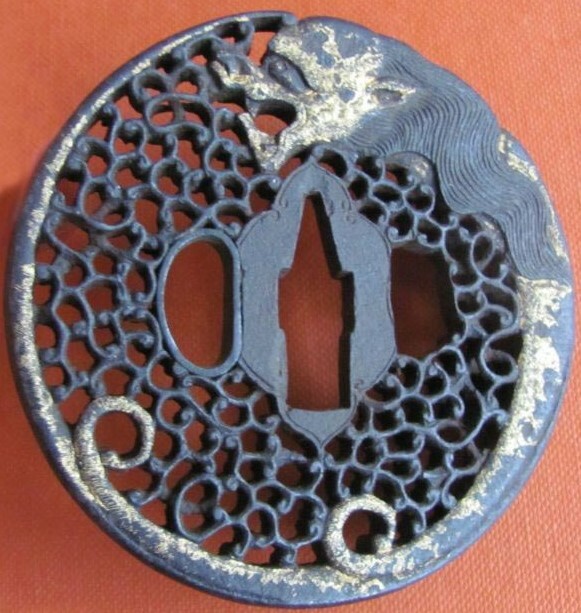 "Imported Sino-Tibetan style Qing tsuba of iron with gold highlights. Incredible complex design of dragon-koi's or 'chilong' swimming in turbulent water, rendered as loukong interlacing. The dragon-koi represents the excercise of positive force. Legend has it that when the koi swimming upstream overcomes a waterfall, it becomes a dragon. These creatures are rendered at the moment of transformation, an inspiration to those after some kind of loss, or in a period of transition. The surface decoration of lotus blossom, flaming jewel on top and pagoda on the bottom are for visual appeal. 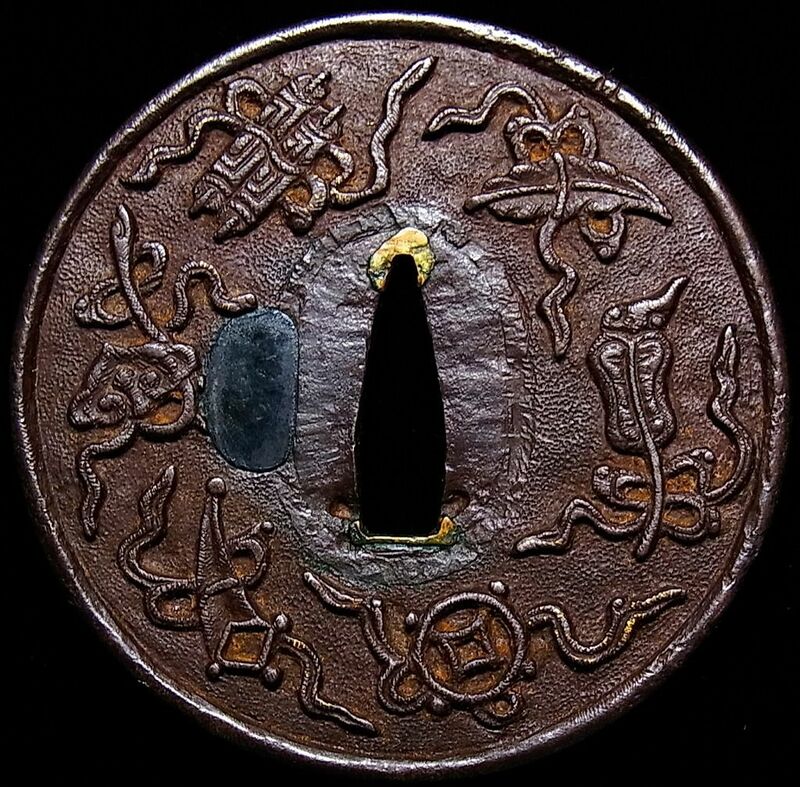 Here is a stunning guard that would immediately be classified as "Heianjo tsuba". But what if we had comparables from elsewhere? History relates that from 1635 to 1853 Japan was a closed country with one way in and out - Nagasaki - and there, only by Dutch proxies, in their dockside confinement of Dejima. Not realistic. Satsuma traded with the nearby counties via the Ryukyus. Hirado continued to trade with Joseon. There was a large nihonmachi at Hoi An, Vietnam, and others scattered across Monsoon Asia. After 1684 Chinese merchants flooded Nagasaki. Within a few decades the Toujin-Yashiki (chinatown) was home to 10% of the population. This guard could very well be Vietnamese. Please note the photo by Peter Dekker of Tromp's Weapons Rack at the Rijksmuseum. Those Japanese-style swords were produced in Tonkin ca. 1660-1680. Early Vietnamese/Southern Chinese guard in Ming style. The subject of foliate designs appears on the verso, while four lotus flowers appear on the recto. The floral motif appears to have been inspired by textile designs. 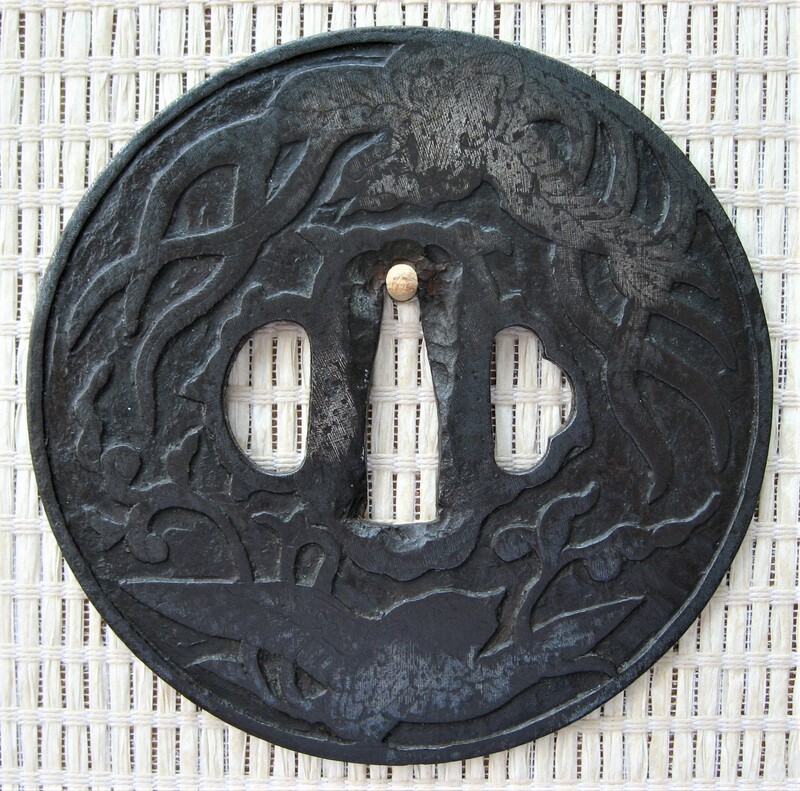 The design of four lotus flowers confirm that this is not a Japanese tsuba. Four of anything in Japanese is 'chi', meaning 'death'. The rendering of the imagery is bold and the execution is excellent. 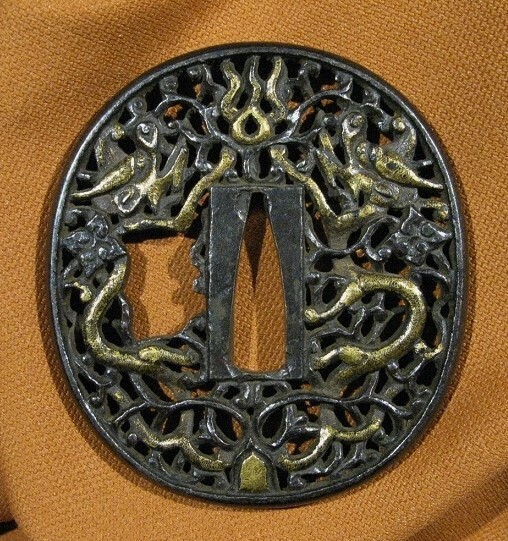 All inlay is done in silver of which a fair amount is missing due to age. The hitsu-ana appears to have been added at a later date. "Minor traces of a Celadon shade of green lacquer appears in negative spaces. This technique, which filled the negative spaces carved out of the plate, is known as 'champleve' (lifted field). Basically, fusing the color to the base metal with heat. This guard is clearly not of Japanese origin, but has been adapted to Japanese use, the hitsu-ana and shakudo fukurin were later additions. Vestiges of gold and silver inlay appear both sides. "Champleve sword-guard of iron originating in Southern Asia. The technique of filling negative spaces carved into the solid plate, is known as "champleve". It seems that the negative spaces were never filled with colored vitreous enamel. The level figures left after carving the recesses are representations of seal script, an archaic form of Chinese. Usually these inscriptions are prayers or axioms of some kind. These have very fine inlay of gold. The opposite face is completely blank and smooth. 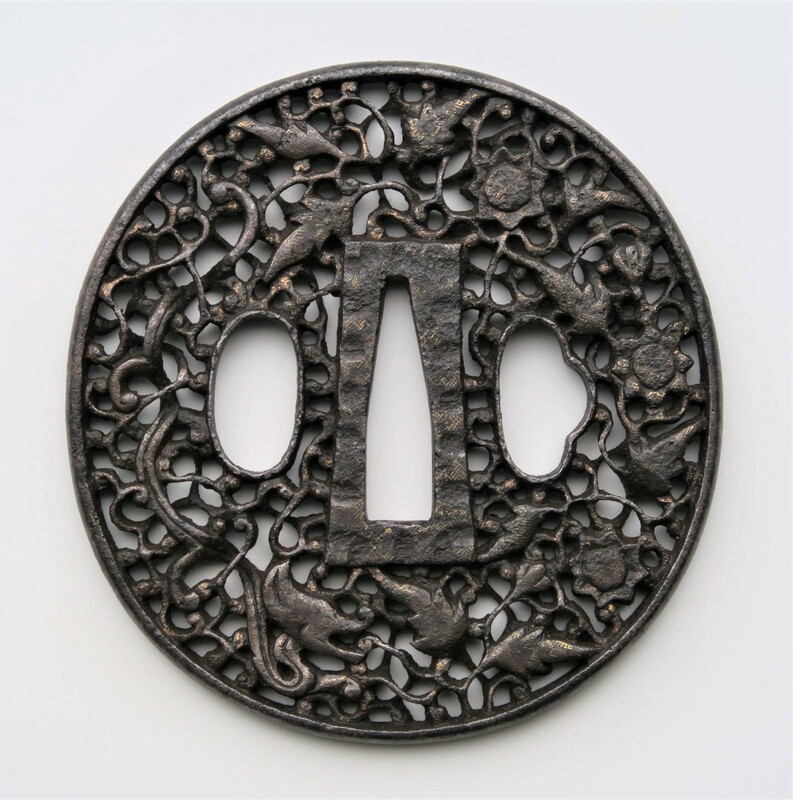 "A small copper sword guard with Daoist symbols on both sides. On one side are representations of the 'Eight Trigrams' of the I-ching, known in China as 'bagua'. This is one of the oldest classical texts, believed to have been written in the Western Zhou of the 8th to 10th century B.C. The trigrams symbolize eight changing states in the world through Yin and Yang. 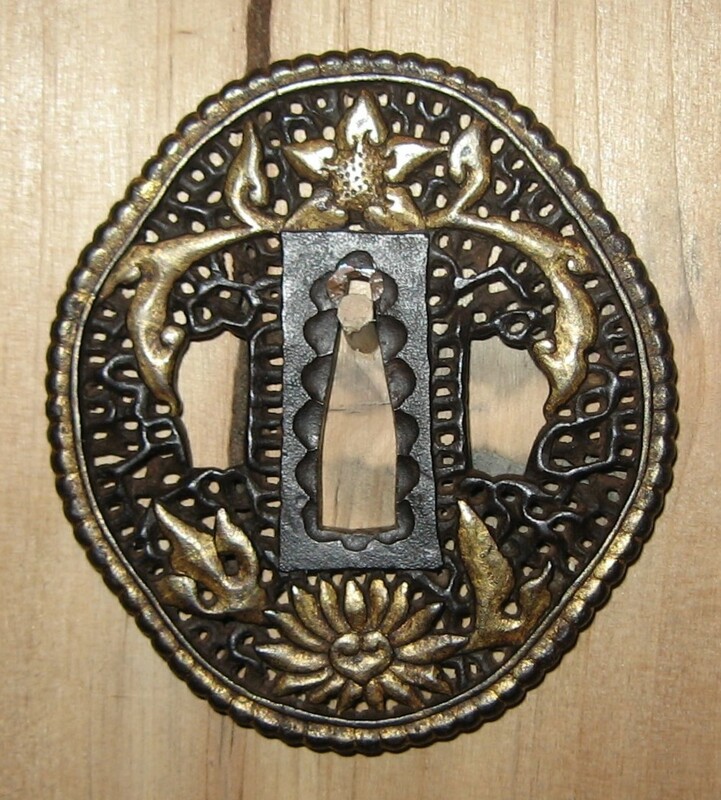 The term ‘nanban’ used in relation to swords and fittings, gave certifying entities a facile way out of a difficult conundrum, which was how to classify something about which they had too little information to make a well-informed attribution. ‘Nanban’ meant ‘unknown foreign sword-guard maker, or unknown tsubako working in foreign style’. 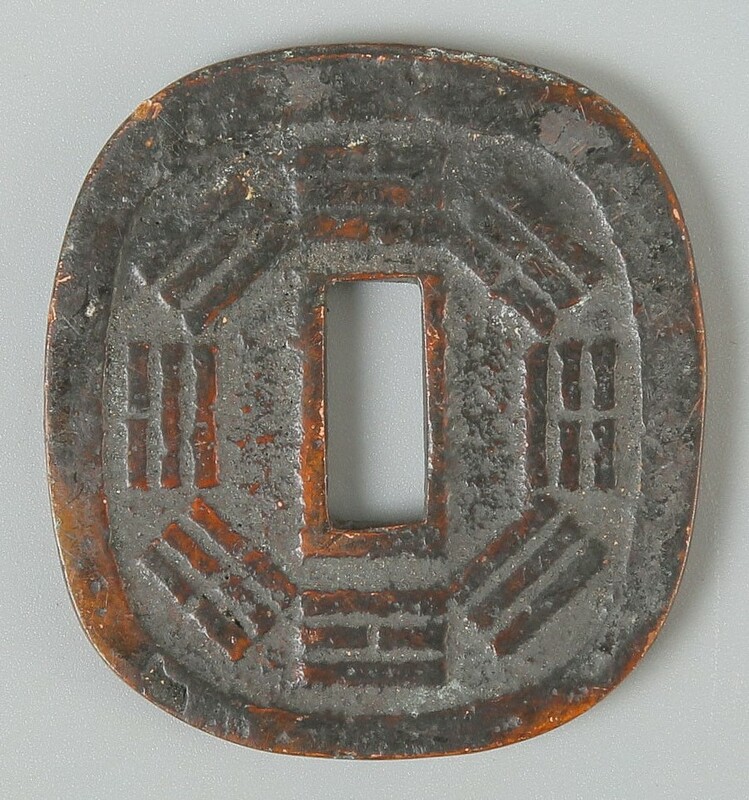 - tsuba of this group are very rarely inscribed. 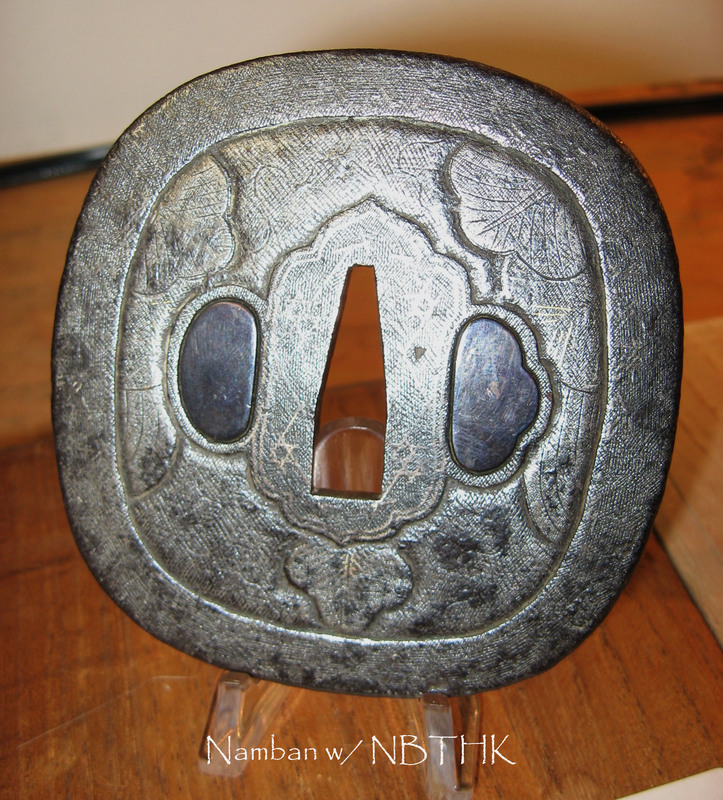 Consider this.....It is very likely that the term "Nanban tsuba" is going to be retired. Aside from its derogatory meaning, it is too vague a term to mean anything specific and thus is mostly useless. 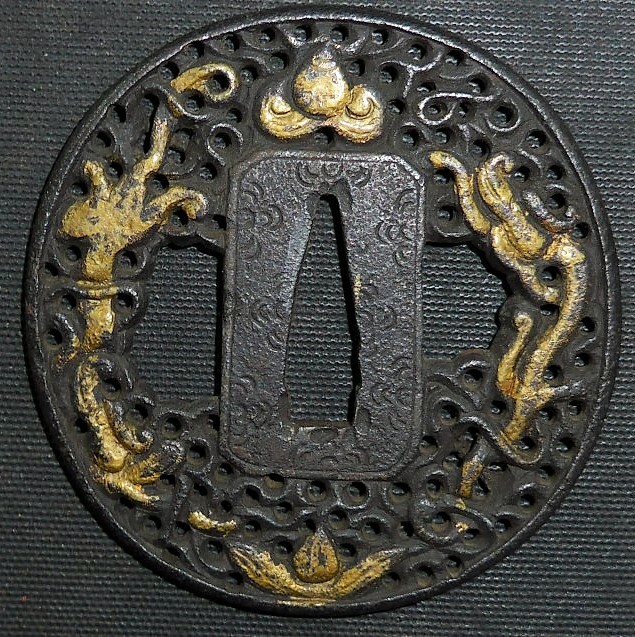 Current research has now been able to identify guards made in Sri Lanka, Vietnam, China, Nagasaki by Chinese carvers, and of course tsuba made in Japan styled or inspired by Asian Exports. 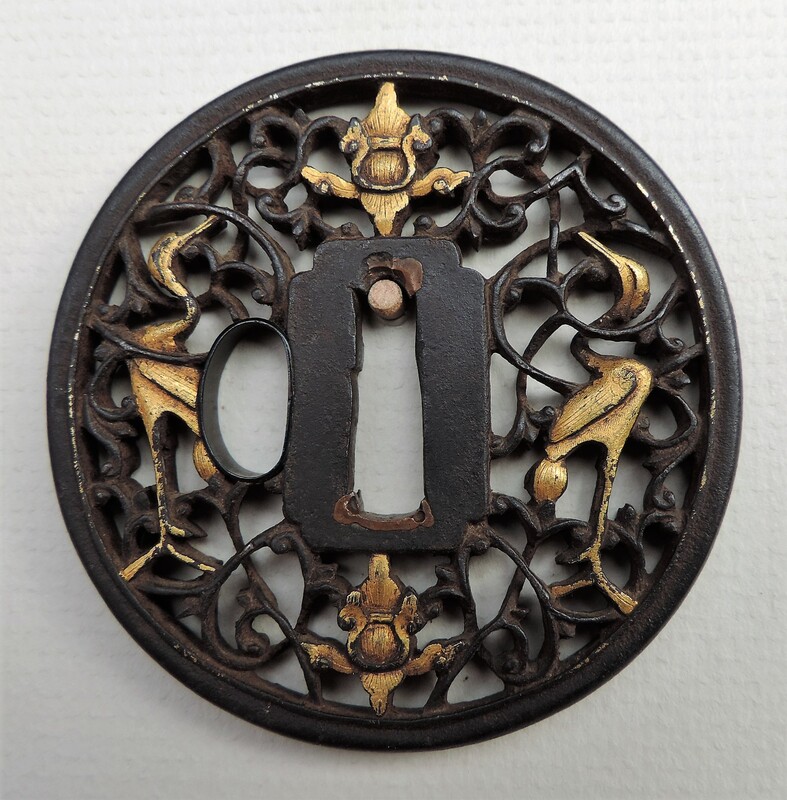 Research has also re-established Joly's connection between "Kanton" tsuba and Tibetan saddle plates. 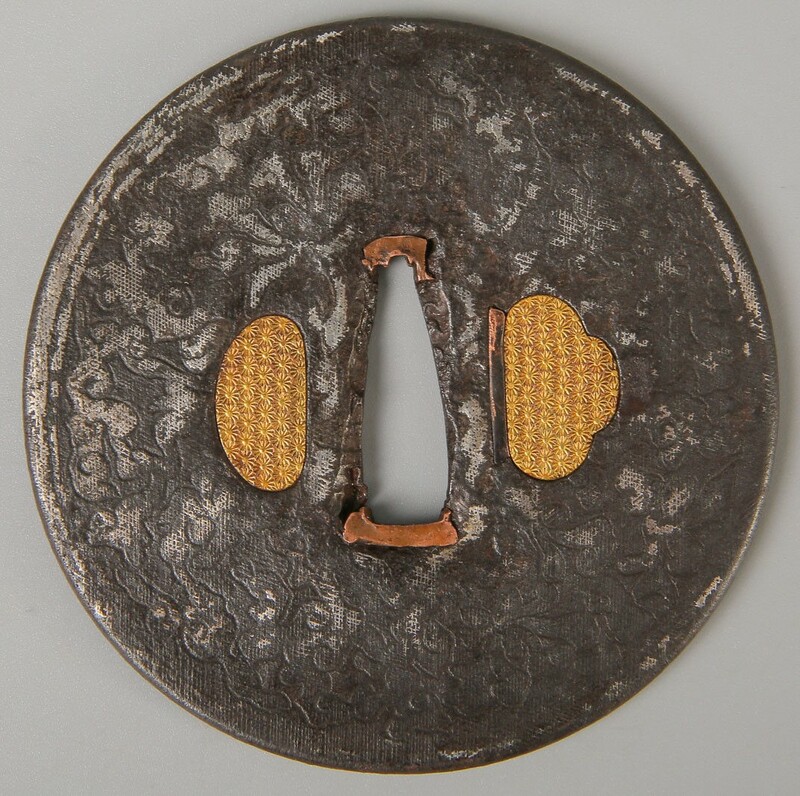 What he did not know, and researchers do, is what changes in Qing military regulations affected tsuba design. 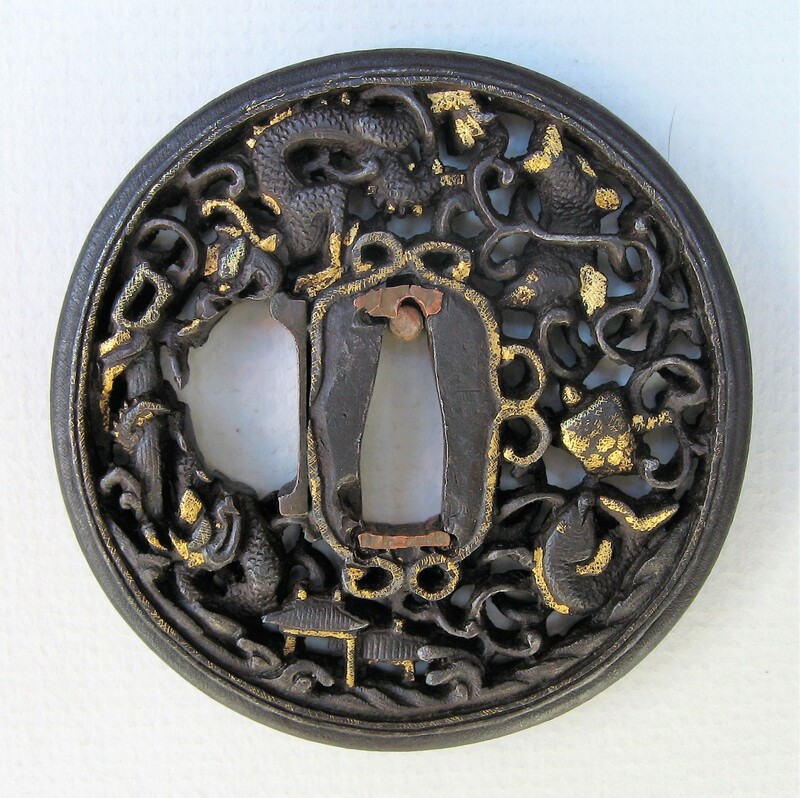 Researchers are prepared to argue that there is no such thing as "Nanban tsuba", and that the term seems not to have been used in reference to sword fittings until the 20th century. Enjoy this excellant article about Nanban Trade. Read about Foreign Influence from 'Jaspanese Sword Mounts' by Helen C. Gunsaulus. 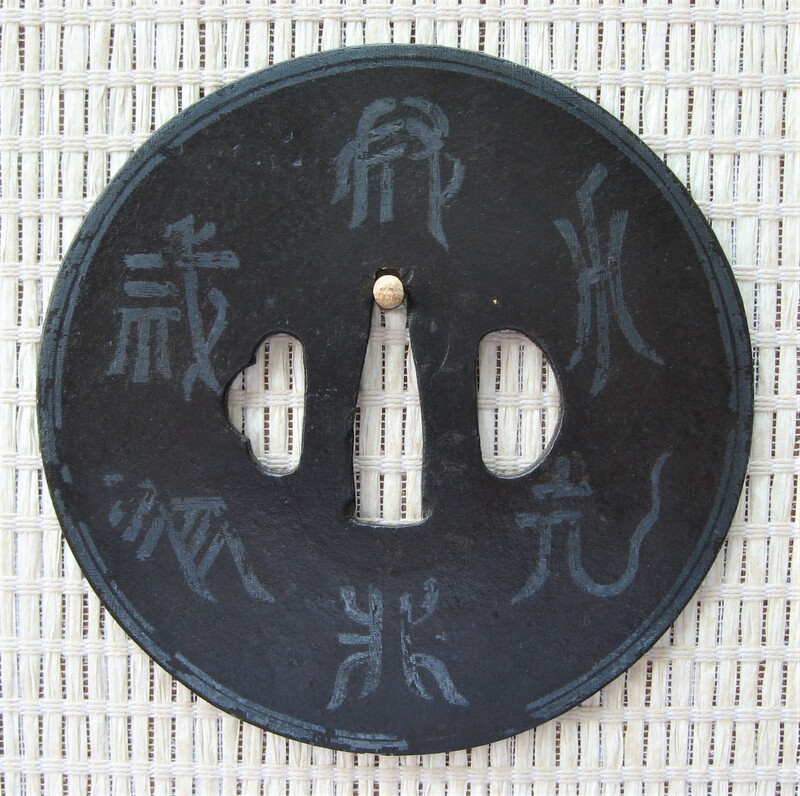 Picture gallery of Excellant Nanban Tsuba for study and appreciation. NANBAN in ASIAN EXPORT style. Accompanied by a Hozon certificate number 447408, issued by the N.B.T.H.K., dated Heisei 17 (2005). 8.0cm x 7.8cm x 4mm, nakago size: 2.8cm x 9mm. If you would like to know more about any items on this website, or if you are considering a purchase, please send Elliott and Robert an E-MAIL ( elliott@shibuiswords.com ), asking us any questions you have or what pieces interest you.